The year is U.C. 0096. 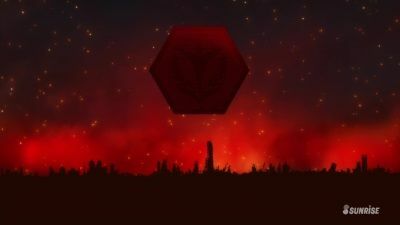 Three years have passed since the end of the Second Neo Zeon War. It is said that the Vist Foundation manipulates the Earth Federation and Anaheim Electronics from behind the scenes. Hoping to create a new world, the Foundation attempts to hand over a certain secret to the Neo Zeon remnants known as the Sleeves. This will mean the opening of Laplaces Box, which holds a great secret tied to the origins of the Universal Century. The exchange between the Vist Foundation and the Sleeves is to take place at the manufacturing colony Industrial 7. This is the home of the student Banagher Links, who rescues a girl he sees falling through the colony's zero gravity area. 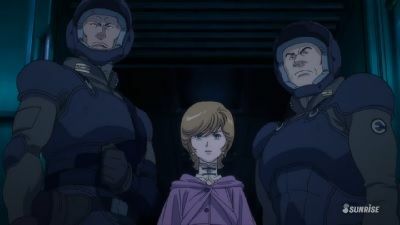 The girl gives her name as Audrey Burne and says she wants to prevent a war, spurring Banagher to step into the conflict surrounding Laplaces Box, almost as if he is drawn in by his own bloodline. 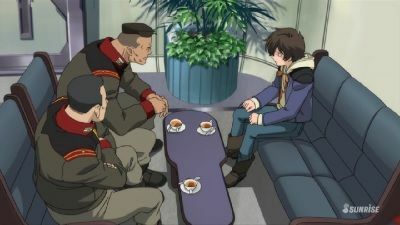 The negotiations between Cardeas and Zinnerman break down as a mobile suit battle begins inside the colony, claiming the lives of Banagher's classmates. Banagher rushes back to Magallanica to help Audrey, but loses his way, and in an industrial block he discovers a white mobile suit with a single horn. Cardeas has been mortally wounded by Alberto, who infiltrated Magallanica, and he now reveals that he is Banagher's long-estranged father. Entrusting Banagher with the hope that he can change the fate of the Vist family, who have been cursed by Laplace's Box, Cardeas gives him the Unicorn Gundam, the key to the Box, and then disappears amid the flames. As Banagher's suppressed childhood memories return, he activates the Unicorn Gundam and confronts the Sleeves mobile suit Kshatriya. He pushes it out of the colony, but finds himself in peril as it counterattacks. 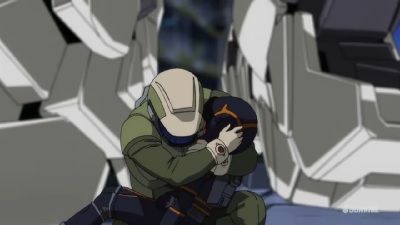 After repulsing the Kshatriya, Banagher loses consciousness, and along with the Unicorn Gundam, he is retrieved by the Earth Federation Forces warship Nahel Argama. The ship has also rescued Audrey, as well as Banagher's friends Takuya and Micott. 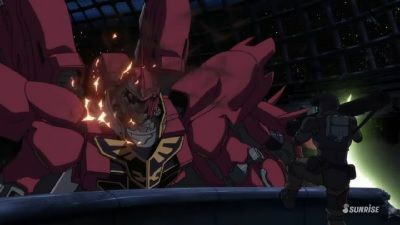 Zinnerman of the Sleeves detects the Nahel Argama's position via a clever trap, and the ship comes under a fierce attack by Full Frontal, known as the second coming of the Red Comet, and his mobile suit Sinanju. Audrey begs Banagher to escape the ship with her in order to dispose of the Unicorn Gundam, the key to Laplace's Box. But Daguza of the Federation's ECOAS special forces group takes her prisoner, demanding that Frontal halt his attack. For Audrey is actually Mineva Zabi, the Zeon princess. Daguza has taken Mineva (or Audrey) hostage, but Frontal rejects his demand for a ceasefire and declares that he will sink the Nahel Argama. In order to save Audrey, Banagher sorties in the Unicorn Gundam, with the support of the Anaheim executive Alberto. However, Alberto's true intention is to have Frontal destroy the Unicorn Gundam, and thus block his path to obtaining the Box. 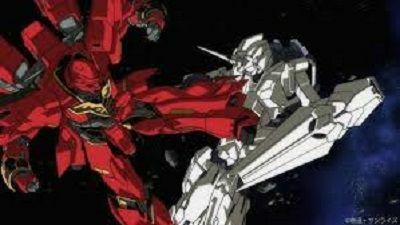 The Unicorn Gundam changes into Destroy Mode, and Banagher engages the Sinanju, but he is taken captive along with the Unicorn Gundam when Marida's Kshatriya launches a surprise attack. Banagher is dragged away to the resource satellite Palau, the stronghold of the Neo Zeon remnants known as the Sleeves. The masked Full Frontal is waiting there to meet him. Removing his mask and revealing his face, Frontal requests the cooperation of Banagher, who can activate the Unicorn Gundam. When Banagher refuses, Angelo berates him for killing one of his subordinates. 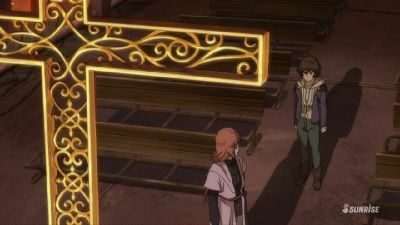 As Banagher struggles with the knowledge of his guilt, Marida takes him to shrine inside Palau. 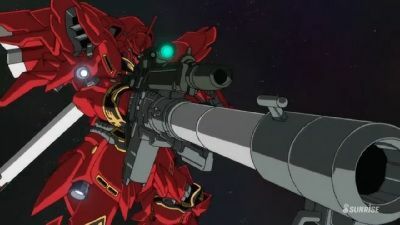 Meanwhile, the Nahel Argama prepares for an operation to recapture the Unicorn Gundam. Captain Otto is frustrated by his impossible orders from staff headquarters, but Daguza, the commander of the operation, asks him to also think of it as a mission to rescue Banagher. 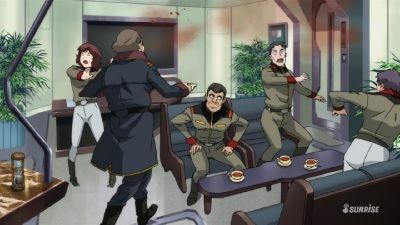 A Federation Forces spy notifies Banagher of the upcoming surprise attack, and he is appalled to learn that Palau will now become a battlefield. At the same time, Micott discovers that Riddhe, having gotten to know Mineva, plans to help her escape to Earth. Learning of Mineva's resolve, Micott lets them go. 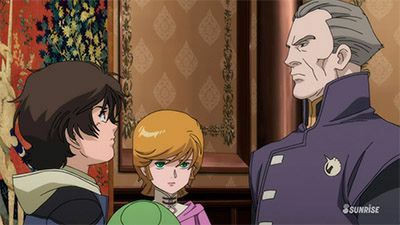 Banagher finally manages to get Audrey to the mansion in Magallanica where she hopes to meet with Cardeas, the current head of the Vist Foundation. Here he sees the "Lady and the Unicorn" tapestry, and feels a strange sense of déjà vu. Cardeas appears, sending Banagher away and then refusing Audrey's plea that he halt the handover of Laplace's Box, which could start another war. 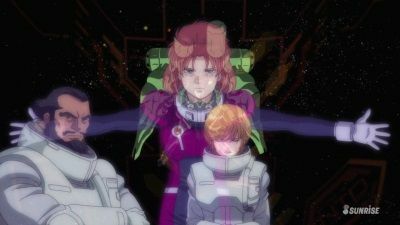 Together with the ECOAS special forces group, the Nahel Argama of the Earth Federation Forces' Londo Bell unit begins an operation to recapture Banagher and the Unicorn Gundam. The resource satellite Palau, stronghold of the Neo Zeon remnants known as the Sleeves, becomes the newest battlefield. Amid the chaos Banagher is reunited with Mineva, who tells him that she is going to Earth to seek the help of Riddhe's father. 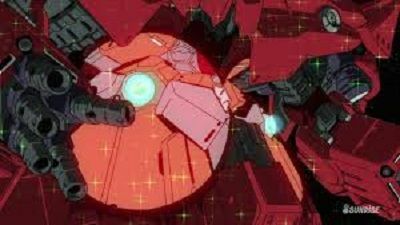 Meanwhile, Frontal attempts to use the Cyber-Newtype Marida to trigger the Unicorn Gundam's NT-D (Newtype Destroyer) system, which is the key to Laplace's Box. As Banagher fights against Marida and her Kshatriya, he learns of her past history and the pain within her heart, thanks to the resonance between fellow Newtypes. The Unicorn Gundam reaches the wreckage of Laplace, and the La+ Program's seal is broken. A speech given 96 years earlier by Ricardo Marcenas, the first prime minister of the Earth Federation government, begins playing back. Daguza realizes that the Gundam is more than just a killing machine to eradicate Zeon, and he tells Banagher that it incorporates something else that is controlled by a human heart. But then Frontal's Sinanju launches an attack, escorted by Angelo and the rest of his guards, and Daguza is killed. Responding to Banagher's anger, the Unicorn Gundam activates its NT-D system and changes into Destroy Mode, overpowering the Sinanju. However, Gilboa's machine is shot down while acting as a shield. As the Unicorn Gundam falls toward Earth, Mineva witnesses it as a descending beam of light. As Full Frontal attempts to seize Laplace's Box, Gael's Silver Bullet stands in his way, only to be crushed by Frontal's overwhelmingly superior firepower. Seeing Gael's plight, Banagher summons the Unicorn Gundam. Riddhe also joins the fight with his Banshee Norn, and the two Gundams confront the huge mobile armor Neo Zeong. However, Frontal uses the Neo Zeong's psycho-shards to destroy all of the Gundams' weapons. Luring Banagher to the end of space and time, he tries to plant the seeds of nihilism and despair. But Banagher refuses to give up, and he is aided by the thoughts of Lalah and others. In response, the Neo Zeong begins to self-destruct. Meanwhile, Ronan decides to use the colony laser to consign the Box to oblivion, and approves its activation. Now on the run from the Federation Forces, the Nahel Argama has taken the desperate step of forming a joint front with the Sleeves. Though his crew resist the idea, Otto orders them to allow Frontal aboard the ship, in an attempt to learn his true intentions. Mineva likewise asks Frontal what he would do if he obtained the Box, and he reveals his idea of forming a Side Co-Prosperity Sphere that would strengthen the economic ties between the Moon and the Sides, excluding Earth and weakening the Federation. The disappointed Mineva predicts that this would result in further tragedies, but nonetheless she tells Frontal that the final coordinates for Laplace's Box are at Industrial 7's Magallanica. Meanwhile, Riddhe has received the Banshee Norn from Alberto, and he sets off in pursuit of the Unicorn Gundam. An article of the Charter of the Universal Century entitled "Future" records the fact that humanity set out into space with the expectation of new possibilities. As a central figure in the Federation government, Riddhe's father Ronan is terrified of Laplace's Box, in which this article is recorded. Now he has approved the firing of the colony laser in order to destroy Magallanica, where the Box is located. Banagher's and Riddhe's Gundams successfully use a psycho-field to defend Magallanica, at the cost of Banagher being absorbed by the Unicorn Gundam. Mineva reveals the truth about the Box to people all over the world, while Otto and Zinnerman help her escape the pursuing Federation fleet. And meanwhile, urged on by the thoughts of his father Cardeas, Banagher returns to Mineva's side. With Banagher, Mineva, and the others aboard, the Garencieres takes off for space. It suffers engine trouble en route, but Banagher refuses to give up. 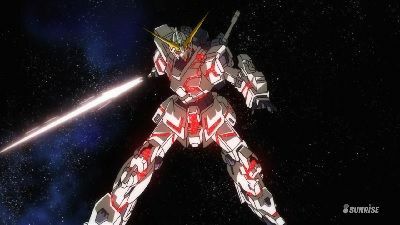 As he struggles, the Unicorn Gundam is surrounded by a mysterious light, and its power brings the Garencieres safely to its rendezvous with the Nahel Argama. 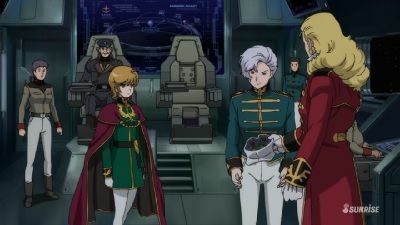 However, the Earth Federation Forces' General Staff Headquarters has decided to eliminate the Nahel Argama and the Garencieres due to their connection to Laplace's Box. As Banagher and the others return to space, they are confronted by the huge General Revil, the biggest warship of the Federation Space Force. They are saved from this desperate predicament by Full Frontal and his Neo Zeon fleet. Having escaped the General Revil's pursuit thanks to the Sinanju's attack, the Nahel Argama is forced to form a join front with the Sleeves. Banagher is despondent now that Full Frontal has learned the final coordinates to Laplace's Box. Marida encourages him, saying that his chance will come if he holds onto his dreams. Meanwhile, Takuya and a few others have secretly called in a Federation Forces patrol ship and are awaiting the opportunity for a counterattack, but they are discovered by Angelo. Taking them hostage, Angelo demands the destruction of the patrol ship, and Captain Otto decides to dissolve the joint front. As fierce fighting unfolds, Banagher confronts Frontal. Mineva also takes a stand against Frontal's plan for a Side Co-Prosperity Sphere, and is joined by Marida. Zinnerman orders Marida to surrender, but her determination overcomes Zinnerman's hatred. 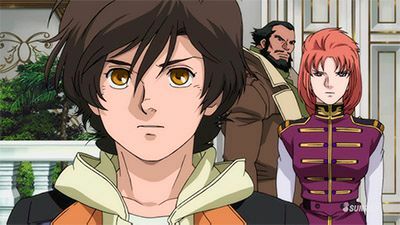 Driven back by Banagher and Marida, Frontal and his comrades escape from the Nahel Argama and head for the Box's final coordinates. 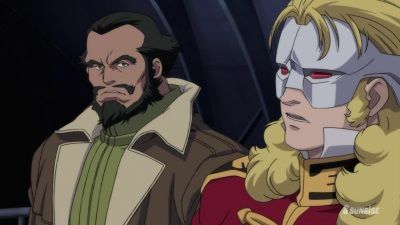 The Zeon remnants have begun a battle at the Torrington base in Australia, where a colony once fell, in order to obtain the coordinates to the Box that will be revealed there. To stop the fighting, Banagher pushes past Zinnerman's obstruction and launches in the Unicorn Gundam. Meanwhile, the Ra Cailum's Tri-Stars mobile suit team intercepts and destroys Kirks, who raised Loni like a father. Filled with rage and sorrow, Loni continues her massacre. The wishes of the dead Kirks bring her back to her senses, but the fury of the Zeon remnants makes the Shamblo run wild again, until Riddhe uses the Unicorn Gundam's beam magnum to destroy it. Stunned by Loni's death, Banagher is now confronted by the approach of a black Unicorn Gundam. Banagher struggles against the psycho-jammers of Angelo's Rozen Zulu. Meanwhile, as Riddhe confronts Marida, he is overwhelmed by a thought resonance phenomenon and destroys the Kshatriya Repaired. Marida's last thoughts reach Zinnerman, Mineva, and the others, warning them that the sector is dangerous. With the shock of her death, the Unicorn Gundam emits psycho-waves beyond measurement, and the bewildered Angelo destroys his own machine. With Zinnerman's help, the Nahel Argama successfully holds off the Sleeves fleet and reaches Industrial 7 airspace. At the same time, Bright enters the Cheyenne base to confront Martha and Riddhe's father Ronan. And at Magallanica, where Banagher and Mineva are headed, Syam Vist awaits. Marida, now a prisoner of the Federation, tells Banagher to keep on saying, "Even so..." She says that he has the power to awaken another system that sleeps within the Unicorn Gundam. Marida herself is to be transferred to Earth on the instructions of Martha Carbine, Syam Vist's granddaughter and currently the acting head of the Vist Foundation. It was Martha who ordered Alberto to prevent the opening of Laplace's Box, the Foundation's lifeline. Meanwhile, Banagher heads for the new set of coordinates revealed by the La+ Program. This is the wreckage of Laplace, the prime minister's residence that was destroyed by a terrorist bombing at the dawn of the Universal Century. 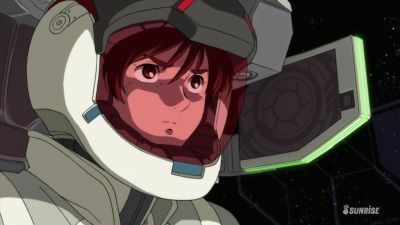 At first, Banagher resists Daguza's orders, but after he learns from Otto that Daguza was the one who led the operation to rescue him, Banagher agrees to launch in the Unicorn Gundam. 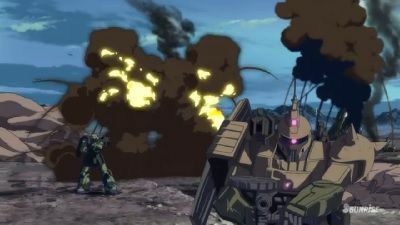 As the Nahel Argama rushes toward Industrial 7, its course is blocked by Sleeves mobile suits. Unless it can break through the enemy lines, Full Frontal will be allowed to obtain Laplace's Box. Also standing in the way is Riddhe's Banshee Norn, which confronts Banagher's Full Armor Unicorn Gundam. Meanwhile, Bright learns from Kai Shiden that an operation is under way to activate the Gryps 2 colony laser and annihilate the Box, and he hurries in the Ra Cailum to the Cheyenne base where the control center is located. Riddhe, trapped by a blood curse, begins running wild. Despite her injuries, Marida comes to the rescue in the Kshatriya Repaired, and orders Banagher to go on ahead. The Garencieres launches an operation to rescue Mineva and Marida, and Alberto orders Marida to stop them. Banagher changes the Unicorn Gundam into Destroy Mode and confronts the Banshee. Meanwhile, Mineva has escaped Martha's hands, and rejects Riddhe's offer of help. Trusting that Banagher will catch her, she throws herself into the air. Just as Mineva hopes, Banagher saves her and takes her to the Garencieres, then heads back to the Garuda to rescue Marida and Zinnerman. 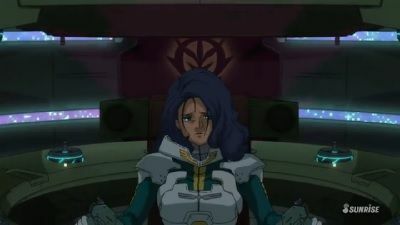 Marida is controlled by her hatred of the Gundam, but Zinnerman's appearance disrupts her determination. In his anger, Riddhe reminds Marida that the Banshee is also a Gundam. She is ejected from the Banshee, and rescued by Zinnerman. After saving Banagher and the Unicorn Gundam, which were falling toward Earth, the Garencieres crash-lands in the Western Sahara. Meanwhile, Zeon remnants who have been hiding on Earth launch a diversionary attack on the Earth Federation capital at Dakar. Ronan, a Federation government official, orders Bright Noa to hunt down the Garencieres. Having descended to Earth with Riddhe, Mineva flees the Marcenas household out of fear that she will be used for political purposes. But the words of an old Earth-born man, who speaks of the good intentions of those who carried out the settlement of space, help her realize what she should do, and she turns herself in to her pursuers. At the same time, Alberto's aunt Martha is reconditioning the Cyber-Newtype Marida so that she can be controlled. And Zinnerman decides to cross the desert to make contact with the Zeon remnants, taking Banagher with him. Banagher's great-grandfather Syam Vist has been waiting for him and Mineva at Magallanica. In the first year of the Universal Century, Syam carried out the terrorist bombing of the Earth Federation prime minister's official residence, and he has used the Charter of the Universal Century that he obtained at that point, now known as "Laplace's Box," to do business with the Federation. However, troubled by the stagnant state of the Federation, he worked with his grandson Cardeas in an attempt to find someone who could be entrusted with the world's future. They used the Unicorn Gundam, which had the ability to discover true Newtypes, as the key to the Box. Having passed this test, along with Mineva, Banagher will now receive the Box from Syam and intends to use it for everyone's benefit. But then Full Frontal appears in the cold sleep room, claiming that he is the Box's legitimate inheritor. Banagher and Frontal begin a final battle over the Box. Attacked by the Banshee, Banagher and the Unicorn Gundam are captured and brought aboard the Ra Cailum. Riddhe is surprised to learn that Alberto is Banagher's older half-brother. 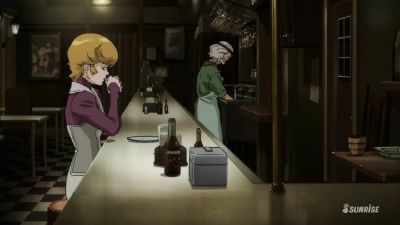 Riddhe's father Ronan has handed Mineva over to Alberto's aunt Martha, who transfers her aboard the giant airlifter Garuda as a pawn to get Banagher to talk. With no avenue of escape, Banagher still continues to hide the new coordinates to Laplace's Box. Bright, the commander of Londo Bell, recognizes that Banagher has the same possibilities as previous generations of Gundam pilots and gives him encouragement. Via Kai Shiden, Bright contacts the Garencieres to plan a joint operation to rescue Mineva. 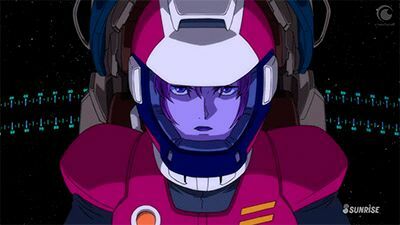 As he makes plans to send the Nahel Argama to provide backup, he sends Banagher to the Garuda, where Mineva is being held.